The French House is the beating heart of the Ogden Honors College, and an LSU landmark. Designed in the 1930s in the style of a Norman French chateau, the French House stands out among the predominantly Palladian style of LSU's architecture. At the time of original construction, its location on Highland Road was surrounded on all sides by farmland. 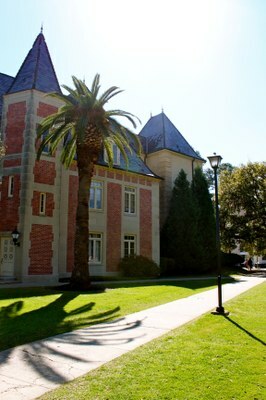 Today, the French House is the main administrative and academic building of the Ogden Honors College, and is part of a bustling Honors Campus at the center of LSU's main campus. Located across the street from the LSU Student Union and adjacent to Laville Honors House, the French House is currently undergoing a $5 million interior renovation that will modernize and expand existing Honors College classrooms, offices, and study and meeting spaces. Throughout its rich and often dramatic 80-year history, the building has played host to many fascinating figures, from Parisian scientists to World War II Army officers, and has been a home for a wide variety of students, academic departments, and historic artifacts. For more on our building's interesting history, visit our French House Historical Timeline.